Stepping Stones are the metaphor for my 'big-picture' hiking project. I'm hopping from rock to rock, each one being another place where I once lived, and each separated from the other by the erratic currents that make up the flow of life. The stones aren't connected by solid ground, yet together they become part of a coherent path. On Day Eleven I reached another stone. After nearly fifty years of shifting currents I returned to the campus of Penn State U where I spent four undergraduate years studying Meteorology and learning to talk to an IBM mainframe computer - a room full of circuits that was stupider than a cell phone - using hand-typed punch cards. I was a dorm rat. 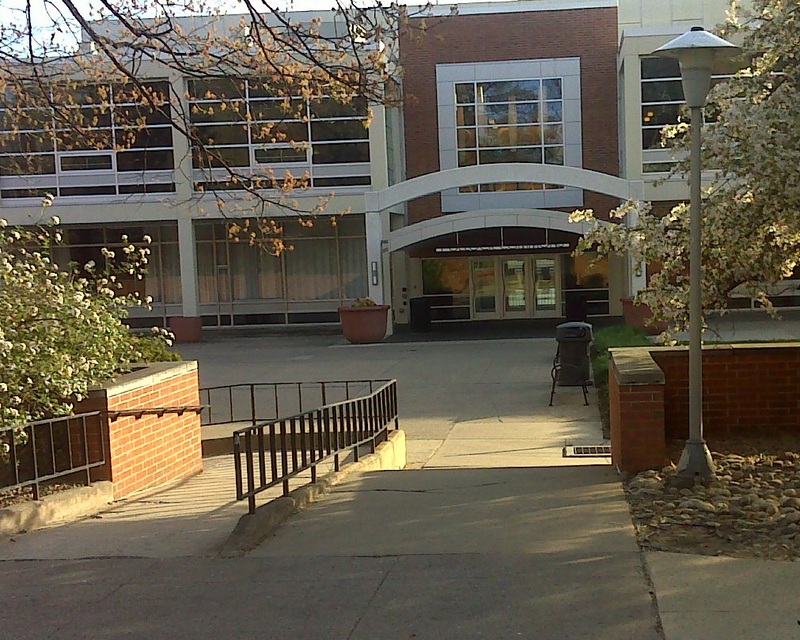 Fraternities were not my style, and I wasn't interested in complicating my life with the independence of an off campus apartment. Amazingly the two dorm buildings that I lived in--Pennypacker Hall in the then hopelessly remote new complex called East Halls, and Shunk Hall down closer to College Avenue on the SE side of campus, remain virtually unchanged in all these years. Here are two photos offered as proof. 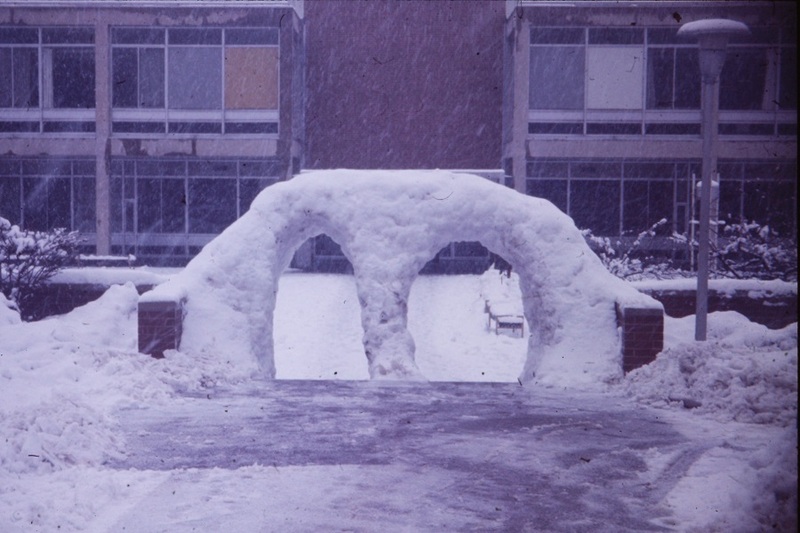 In January, 1969, during a heavy wet snowstorm, my friends and I stayed up all night building an interactive snow sculpture--a set of arches over the steps in front of the Pollock Commons (our cafeteria building, then called the PUB - Pollock Union Building). The maintenance crew responsible for clearing the snow allowed the arches to remain for several days before removing them. And here's today's view from roughly the same location as the second photo. They've added two arches over the entrance! 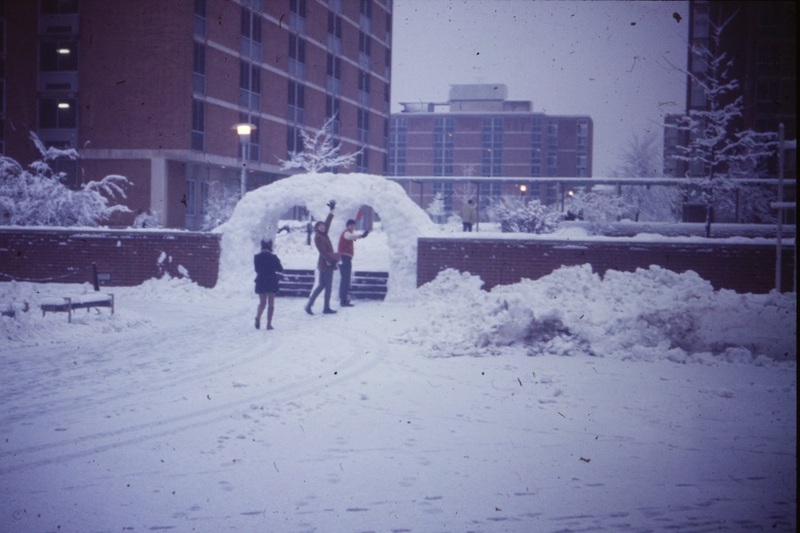 Wow - did they take their remodeling inspiration from our long-ago snow arches??? Note the upgraded but still present street light fixture at right in both photos. They've modernized the look of the place, and seriously upgraded the student's dorm experience since my day (cafeteria food then was 'you get what we serve', now it's a buffet including unlimited PSU creamery ice cream in a dozen or more flavors), but the bones are the same. It was a quiet Sunday morning when I visited campus--good for nostalgia. The McLanahan's book store on College Ave was open, still in the same place. But now it's much more of a clothing and memorabilia store than a student supply store. Three doors down the same McDonalds that I frequented as a student was still in business, now open 24 hours. Back then the Big Mac hadn't been introduced yet. Their big new thing was the double cheeseburger. I looked for the Hi Way Pizza place where we used to hang out, but it was gone. The company still exists, but now their one location is far from campus. I've visited Penn State a few other times since I was a student there. The last time was with my daughter when she was touring campuses as a high school senior. Other times were on business. But this was purely a walk back in time. I walked in from the mountains, spent an hour bathing in memories of a bygone era, and then walked back to the mountains. Happy Valley, as they call it, looks happier from the vantage point of a mountaintop, where all the nitty-gritty of college life fades into a patchwork of green meadows. 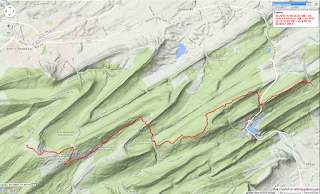 As I approached Penn State on Day Ten I passed some of the places my friends and I hiked when we wanted to escape the campus drudgery. Prime among those was Bear Meadows - an 800 acre bog with rare species and a microclimate that allows frost all year (or did back in the 60's). As I retreated from Penn State I picked up the Mid-State Trail and followed it under US 322. That was sort of the dividing line. Once north of there I was truly back to wilderness hiking. US 322 is busier than many interstate highways. The trail goes under it via a little culvert--not much more than a drain with a narrow sidewalk and hand rail. It was so tiny I had to crouch low as I walked through. On the other side I was startled by a twitter and flurry of wings as a bird flew its nest. There it was - a neat little nest perched right on the hand rail with five ivory yellow eggs. Breakfast! Just kidding. As always I took only photos and left behind only a smile. One last note on this segment of my hike. It's about 'Trail Magic'. They say "the trail will provide". True trail magic comes in may forms, comes unbidden, and is not expected. True magic can only come when you least expect it. I was lost. As I was transferring my vehicles from the south side of US 322 to the north side I could not exit on the road shown on the map. 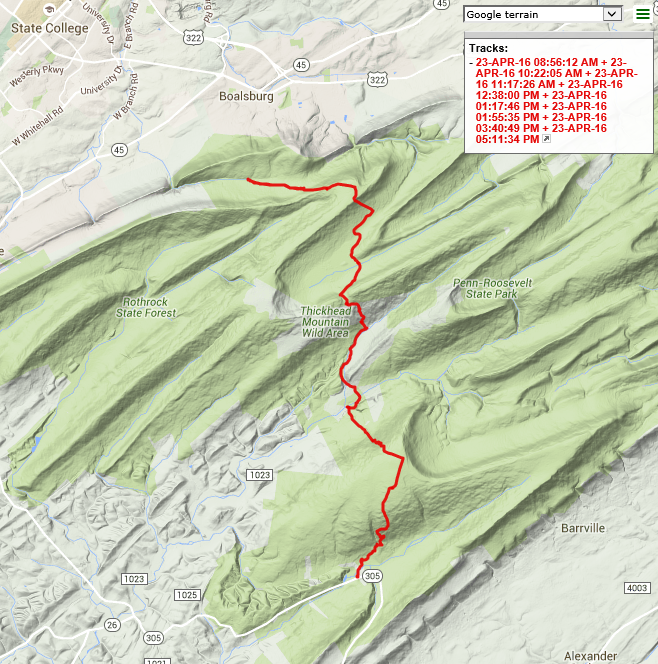 You can't get on or off 322 in very many places, and none are close to the trail crossing point. I found myself in the town of Milroy - a one-horse town, literally (Amish carriages). I asked for directions at the huge truck stop beside the highway. They didn't even have a local map. I asked at the Dollar General across the store. No luck. I was about to give up when, as I was pulling out of the Dollar General parking lot, who should drive in but a DCNR forestry warden. Voila! I flagged him down and got all the information I needed. I would never have found my way on my own, because the road I was looking for was gated and abandoned. The officer even gave me a map and took my vehicle license plate and description, promising to look after it as I parked it overnight. "The trail will provide." In situations like this it's hard not to believe in magic. 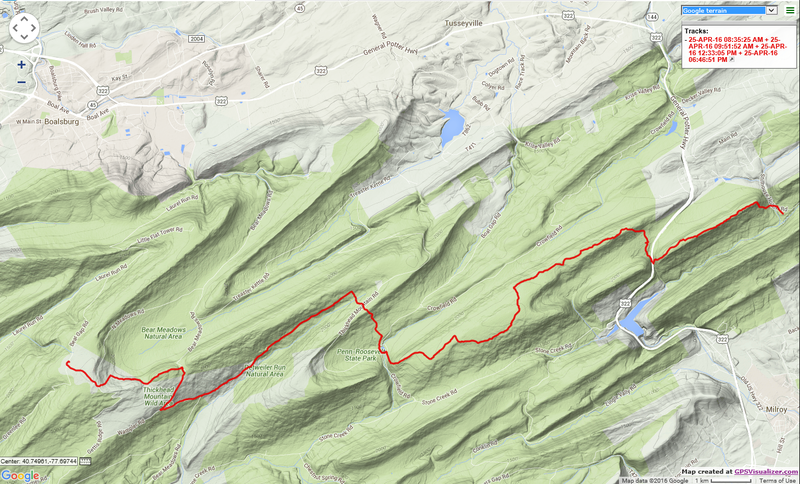 Here are the GPS tracks screen shots for the three day hikes covered in this report. 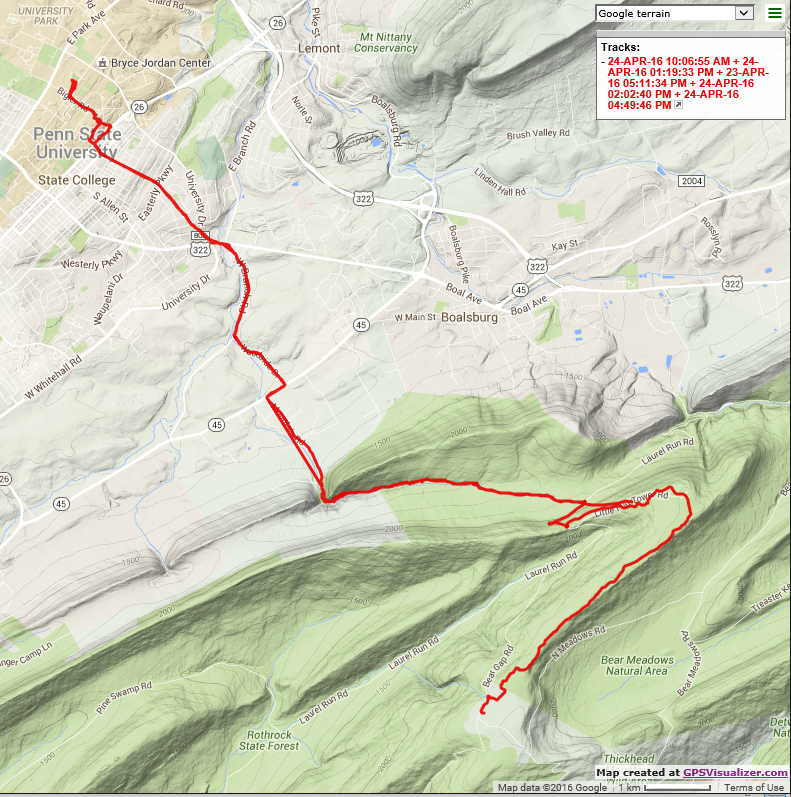 The hike to and from Penn State was basically out and back via the same route, which is why it looks a little busy. 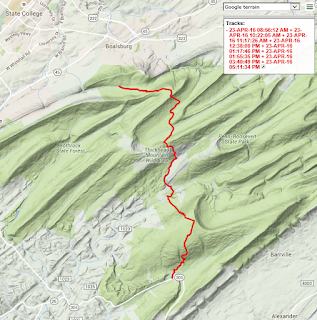 If I can get EveryTrail to work, I'll add interactive maps and more photos. Stay tuned.